Home / eLuxury Official Blog / Should I Let My Pet Sleep With Me? Should I Let My Pet Sleep With Me? If you or someone you know has a family pet, you likely know first hand how important a pet is to their owner. They become an everyday part of their lives and an important family member. With our pets being such a large part of our lives, it only makes sense that we spend a large part of our day with them as well! As comforting as our pets can be, it might not always be the best idea to have them with us constantly. One of the best times to part with your pet is at night, for the benefit of both you and your beloved companion. So, the question is: Should I let my pet sleep with me? When laying down for the night, your main goal is obvious -- Sleep! When you bring your dog or cat with you to bed, you are running the risk of them disturbing that much-needed rest. With cats in particular, some of their more active hours seem to be at night, and it can be incredibly difficult to get decent sleep with your feline companion running across your face. Similarly with dogs, if you happen to get up in the middle of the night to get a glass of water, they may interpret this as time to get up and play, delaying your chance to get back to a deep sleep. While your furry friend may not be as happy not sleeping on the bed with you, it will be beneficial for you both to spend this time apart. When putting together your perfect bedroom space, it often doesn’t come cheap. The perfect sheets, comforter, duvet, and pillows are all a necessity to ensure you have a peaceful room to lull yourself to sleep. When letting animals into your bed room, you run the risk of some of these products being damaged. Fido may not intentionally snag your brand new sheet set, but accidents do happen! Your pets are also more likely to get dirt and debris on their paws, which can be easily tracked onto your bed. Nobody wants to sleep on dirty sheets, and it is terrible for your skin. Even if your dog’s feet aren’t muddy, they are still covered in dirt and grime from outside. To prevent a late night load of laundry and to preserve the condition of your bedding, keep your animals off your bed and in their own space. Another great reason to separate yourself from your pet in the evening is something that is very important to me personally! 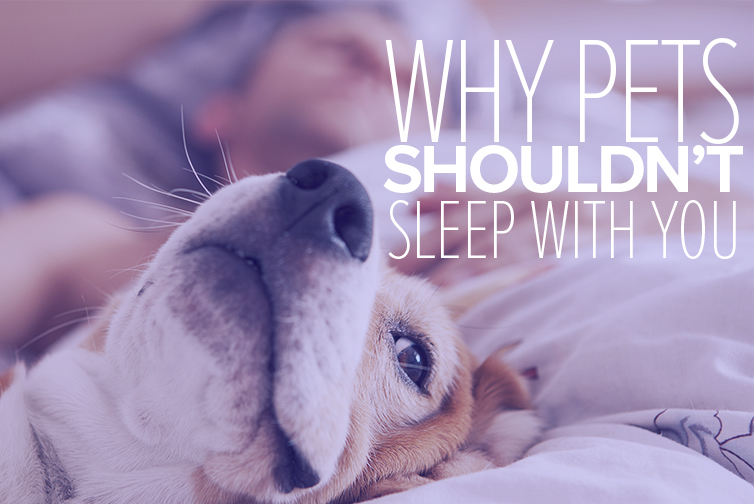 As someone who deals with allergies, it can be difficult to sleep while your pet is sleeping next to your face, exposing you directly to their pet dander. While your allergy medications may do great at fending off those sneezing attacks during your normal day, you might not fare so well at night with Fluffy sleeping directly on your face. I personally keep my bedroom a pet free zone so that on the days that my allergies are particularly bad, I have a place where I am able to distance myself from the highest concentration of pet dander and allergens. Sometimes, our pets pick up unwanted guests. If you’ve recently been on a hike with your best friend, or even just visited the pet park, they may have grabbed a hitchhiker without your knowledge. Fleas and ticks are pretty gross and definitely not something that we want to sleep with at night. Not only are they disgusting, they can transmit disease to humans. Even if you are unaware of your pet bringing any bugs into your home or bedroom, they can often be elusive and turn up when you least expect them. As a personal rule, I would rather be safe than have to try and remove fleas from my mattress and bedding! One way to make yourself feel much less guilty about kicking your pet out of bed while making them possibly even more comfortable than you is by getting them a super nice pet bed that is all their own! The eLuxury pet beds are custom-made for providing the same level of comfort for pets that their human pals get to enjoy. This may make it much easier on you and keep you out of the "dog house" with your pet. Overall, pets can be a great support system and friend for us. They are always there when we need them with unconditional love and companionship. While this can make us feel great, it doesn’t necessarily help us sleep. Take some time away to enjoy your bedroom by yourself and get the stress free night’s sleep that you deserve. Even if you do decide to ignore our advice and let your furry friend sleep with you, it is helpful to be aware of the potential issues to help you prevent them!